As it comes from the sheep’s back, wool is not a very promising fibre in appearance. Even though the sheep have been washed shortly before shearing, dirt and leaves, grasses and thorns, cling closely to the matted and tangled tresses of the fleece. Dead hairs, or kemps as they are named, mingle with the healthy wool; different parts of the fleece vary in length and quality of fibre. Yet from the dirty and tangled mass of mixed fibres fine threads are drawn and fabrics woven. The great mass of wool is used in the manufacture of woolen and worsted cloths. Used for the pile of all classes of carpets, for felts and knitted fabrics. Blankets, flannels, baizes and other special fabrics use up a considerable quantity of fibre. 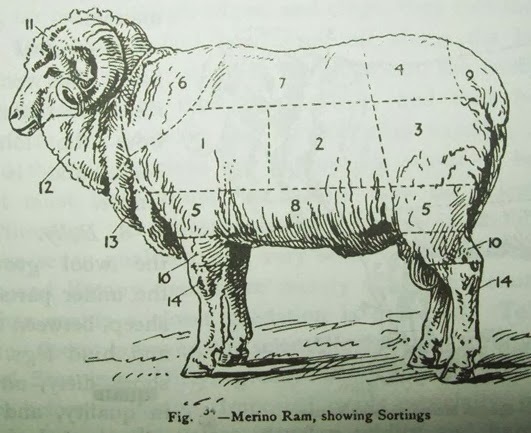 Closely examined, the fleece of the common sheep shows thirteen or fourteen different qualities of wool. As a rule, one quality of wool is found in the same part of every fleece taken from the same species of sheep. To obtain a uniform quality of wool, therefore, we take the same section out of any number of fleeces. In other words, we sort out each fleece into as many divisions as there are qualities of wool. It is evident that, only a small quantity of each quality can be obtained from a single fleece, and that we require a great number of fleeces for a given ‘make’ of yarn or cloth. This, however, is of little consequence in a factory where thousands of fleeces are consumed weekly, and the division of the fleeces gives to the manufacture a uniform quality of fibre for either high or low classes of work. Picklock (Fore shoulder) – Choicest in fineness of fibre, elasticity and strength of staple. Prime (Middle of body) – Slightly inferior in strength, but otherwise as good. Choice (Back) – True, but not as fine as prime. Super (Lion) – Not so valuable as choice, but similar in general properties. 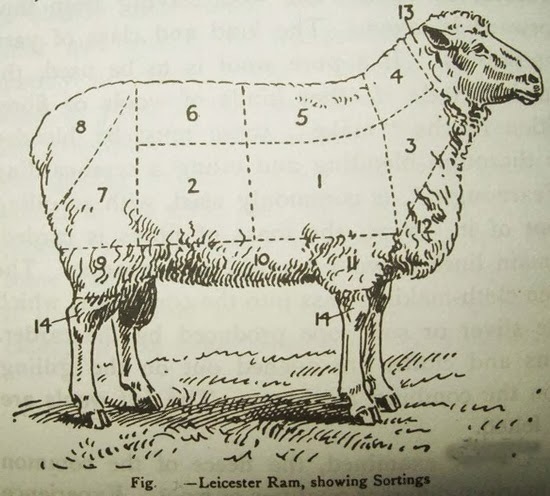 Drawn right (Lower sides) – Showing tenderness, but fair quality of wool. Seconds (Throat and breast) – Best of the wool from these parts. Breech – Short, coarse hair from the hinder parts. Blue – From the neck. Fine – From the shoulders. Neat – From the middle of the sides and back. Brown-drawing – From the haunches. Breech or britch – From the tail and hind legs. Cow-tail – When the wool behind the legs is very strong. Brokes – From the belly and lower parts of the front legs, classed as super, middle and common, according to quality. Woolen sorting gives nine classes and worsted sorting ten grades of wool from one fleece. Scientific sorting theory makes a closer grading for both industries; but the practical sorter seldom acts up to theory, his sorting numbers usually falling short of even the nine obtained by the woolen masters of an older day. Shoulder: Long and fine wool, growing close and even. Side: Stronger, but otherwise equally good. Neck: Short, but fine, liable to be mixed with grayish wool near the head. Back of neck: Inferior to first three. Top of fore shoulder: Faulty and irregular, but of fair medium quality. Lions and back: Rather coarse and short, but fairly true in character. 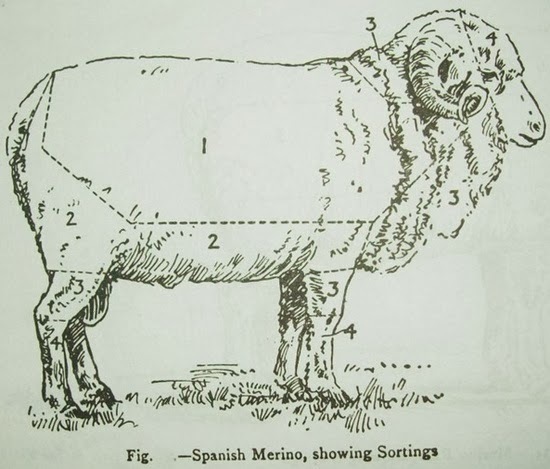 Middle of haunch: Long, strong wool of large staple, grading from fine to coarse. Hinder parts: Coarse and long, apt to be hairy. Top of hind legs: Very like 7, but rather dirtier. Under body: Short, dirty, but fine towards the fore legs. A tender wool, and known as ‘brokes”. Top of fore legs: Short and fine. Throat: Irregular, short, and kempy; very often full of grass and fodder. Head: Short, rough and coarse wool. Shanks: Rough, hard wool; very short and of little value. Shoulders: The wools grown on these parts are commonly the best in the fleece, being specially strong and long in staple, soft in texture and uniform in character. Lower part of back: This is also wool of good, sound quality, resembling in staple that obtained from the shoulders and sides, but not so soft and fine in fibre. Loin and back: The staple here is comparatively shorter and the hair not so fine, but the wool on the whole is of a true character. In some cases, however, it is rather tender. Upper parts of legs: Wool from these parts is of a moderate length but coarse in fibre, and is disposed to hang in loose, open locks. It is generally sound, but liable to contain some vegetable matter. Upper portion of neck: The staple of the wool clipped from this part of the neck is wholly of an inferior quality, being faulty and irregular in growth, as well as full of thorns, twigs, grass, and other matters. Central part of back: This wool closely resembles that obtained from the loins and back, and is rather tender. Belly: This is the wool grown on the under parts of the sheep, between the fore and hind legs. It is short, dirty and poor in quality, and somewhat tender. Root of tail: Fibre coarse, short and glossy, and very often the wool is mixed with kemps or dead hairs. Lower parts of legs: Most of the wool grown on these parts is dirty, greasy, and rough, the staple lacking curliness and the fibre fineness. It is usually full of burrs and vegetable matters. Head: The wools from the part is stiff, straight, coarse, mixed with fodder and kempy. Shins: The wool from the shins is short, straight and stiff and of small textile value. Refina: Extending from the lower jaw down to the fore fore shoulder, across to the haunch, curving round to the back above the tail. Fina: Taken from the belly, hind quarters, and upper thighs. Tercina: Short wool taken from the head, throat, lower part of the neck and shoulders, ending at the joint. Inferior: From forehead, cheeks, tail, and legs.